ESATAN-TMS provides a high-productivity and powerful thermal modelling environment, supporting the complete thermal analysis process from geometry creation, radiative and thermal analysis, and post-processing of the thermal results. ESATAN-TMS 2016 not only provides a new look and feel to the product, but also provides improved productivity. This new release also includes functionality to model UV radiative emitters and the ability to include non-isotropic materials. ESATAN-TMS 2016 also contains a large number of general improvements and bug fixes. ESATAN-TMS 2016 sp2 contains mainly bug fixes and performance improvements. The number of colours available for discrete displays, such as display of thermo-optical properties, has been significantly increased. Both the discrete and the continuous legend are now selectable, highlighting the corresponding geometry. Use of fixed scale based on results when displaying results at single position. Assemblies are now oriented when displaying results at the single position. Easy validation of assembly movement with a new option to visualise the movement as soon as defined. Animation of the display stepping across results at all positions and timesteps. Data from within the picking table can now be selected and copied across. Support of larger models by ESATAN-TMS Thermal with a revised memory handling mechanism. ESATAN-TMS 2016 addresses a large number of feature requests raised by customers covering all areas of the thermal modelling process. Simple interface for defining the thermal solution which now includes both an interface to specify the output from ESATAN-TMS Thermal. Improved handling of the users template analysis file. 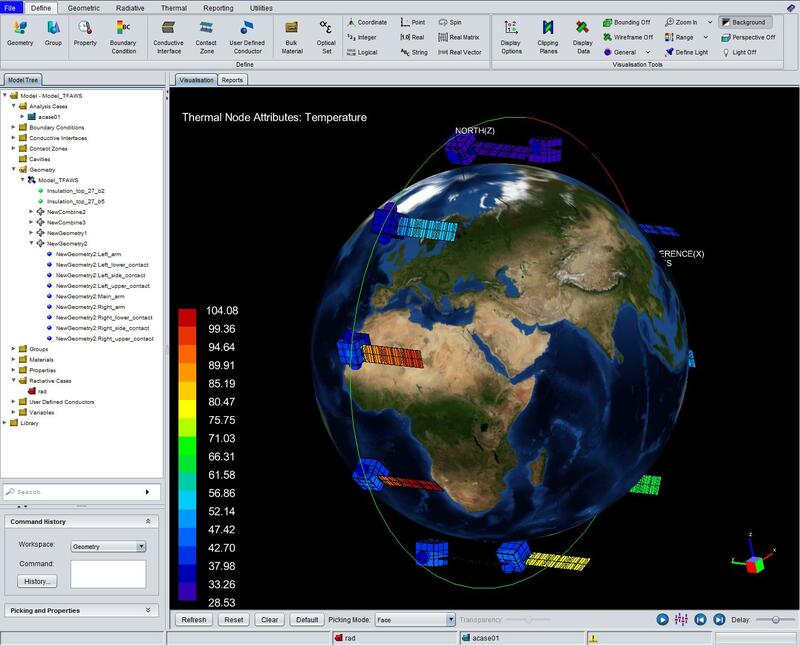 An Analysis Monitor provides real-time feedback from the thermal analysis, including graphs of convergence. Support for the definition of thermostatically controlled heat sources. Provides a high-productivity thermal modelling environment, with much of the process driven through the visualisation. Increased visualisation area by redesigning the layout of Workbench. The menu bar has been replaced with a modern ribbon bar, including toolbar icons to directly drive the main modelling steps. Provides an interactive method to create geometry combinations and cuts directly through the visualisation. To aid visualisation, the geometry representing the cutters can now be optionally displayed as transparent. Each cutter can be selected, and the cutting sense can quickly and easily be reversed using the new "Switch Sense" menu option. Single Cut and Combine dialog providing a simple and more flexible interface. Simplified modelling allowing surfaces emitting UV radiation to be defined and applied to the radiative simulation. Supporting facilities are provided to validate the model definition, for example displaying the beam directions and visualisation of the emitting rays. The orbited planet can now be selected and a default set of properties are provided for the selected planet, along with a planet image. Spacecraft orientation can now be defined for multiple orbit periods. Flexibility of the orbit definition has been increased. The Interface to display data has been completely redesigned to provide a single interface to select the data to display, also with direct access from the model tree. Capability to model orthotropic materials. Bulk material definition has been extended to support selection of isotropic or orthotropic material definition. For orthotropic materials, three values of conductivity are specified. The material is applied to the geometry as normal. New display "Material Orientation" to help verify that the material has been applied correctly. Improved process to generate Conductive Interfaces; both by increasing the flexibility of the process and by also extending the coverage to include identifying interfaces for cut shells.